The other day I read this review in the Financial Times of Power & Style: A World History of Politics and Dress, a new book on power dressing. The reviewer expresses a frustration with authors Dominique and François Gaulme for focusing mainly on male western fashion. Not having read it, I cannot comment on this particular book. However, there exists a general bias in the literature on fashion towards emphasizing the importance of western dress. Fashion tends to be equated with modern western society, thought to have emerged with modernity and the rise of mercantile capitalism. The central idea is that the key feature of fashion is change, and that the constant and fast change of style trends over time is dependent upon certain social conditions specific to western society. This idea, as scholars with a more expanded view of fashion would argue, operates on hegemonic power relations. The consequence of the west making claims at modernity, change and fashion is that the rest of the world is stuck with tradition, timelessness and anti-fashion. This is not to say that there are no features that are specific to western fashion, but that there still can exists fashion outside the west. The globalisation of the fashion industry means that it is no longer possible to completely separate systems of dress based on geographical belonging. Rather, systems of dress around the globe co-exist, compete and interact with each other. Now, why care about the definition of the concept of fashion, as trivial as it might seem? It’s not exactly news to point out that the power relations in the world are shifting. Well, I believe that the western tendency to equate certain cultural expressions with modernity and change as specific to the west is a good measuring device on where our culture places itself in relation to other cultures. 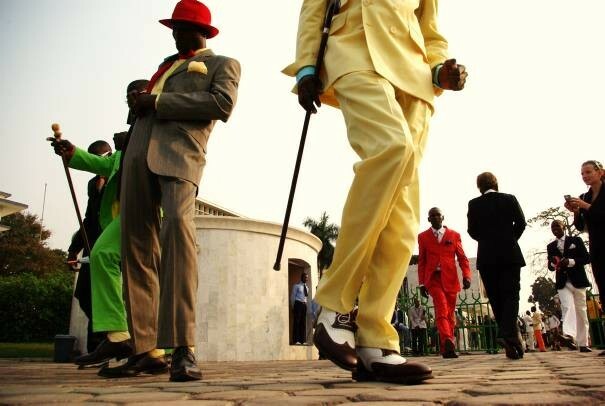 Sapeurs; fashion conscious men in Congo.